A wide view of the Economic and Social Council (ECOSOC) Chamber as it held its 2016 Integration Segment. Integration across sectors and disciplines, and between actors and institutions, is essential to drive forward and successfully implement the United Nations development agenda, the Vice-President of the UN Economic and Social Council (ECOSOC) emphasized at the conclusion of a three-day segment on promoting integration of the three pillars of sustainable development. 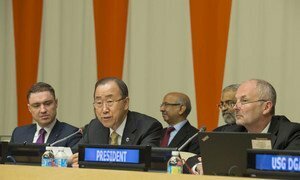 United Nations Secretary-General Ban Ki-moon today underlined the importance of devising creative and coherent approaches in linking the economic, social and environmental dimensions of sustainable development as world leaders continue to work towards successfully implementing the UN development agenda.